Education Minister and Jewish Home chairman Naftali Bennett opened the weekly Jewish Home faction meeting Monday by speaking about the controversy surrounding the "Appellants Law." "The law appointing the legal advisers that the justice minister is submitting is a correct, balanced, and necessary law. Our goal is simple: advisers will advise, the government will govern, and judges will judge. 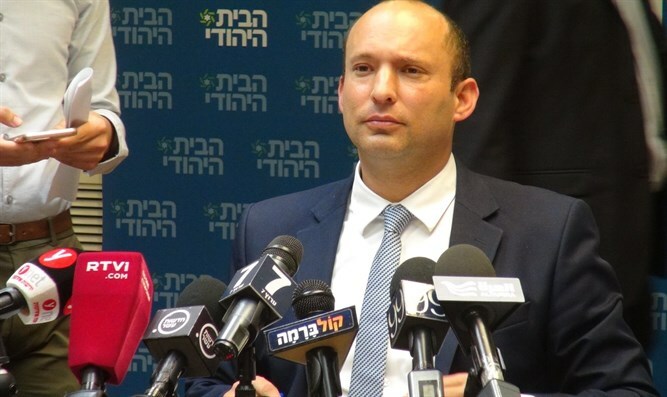 In the elections scheduled for November 2019, the public will again elect its leaders, not the officials," Bennett said. Bennett addressed the security situation in the south: "The enemy's experience is clear - to accustom us to a situation in which the south is burning and the Israeli response will be moderate to weak." According the Bennett: "There have been arguments over the last few weeks about the nature of the enemy and the nature of the treatment of the kite launchers and the detonators,. So yesterday the debate was decided with the IDF announcement - this is neither popular resistance nor eight-year-old children. This is terrorism initiated, directed and operated by Hamas. In the face of terror, we do not fight with silk gloves. When a terrorist acts against the State of Israel, we shoot him in order to hurt. This is my position, and I will continue to advance it, out of an understanding of the importance of force and its operation." Regarding the Trump Administration's peace initiative, Bennett said, "At the end of last week, the emissaries of President Trump, Jared Kushner and Jason Greenblatt visited Israel, and in a relatively unusual step, Kushner was interviewed by a Palestinian newspaper and said what we have long understood. [Abbas] prefers to continue starving his people and to curse the president of the United States instead of conducting a real dialogue. We will examine every proposal made by the American administration, which has so far proven to be a true friend of the State of Israel, but we will not compromise on the national, moral and security interests of the State of Israel." In response to a question about Prince William's visit to eastern Jerusalem, Bennett said, "We welcome him. We welcome everyone who visits our capital. Jerusalem is the capital of the Jewish people, and only of the Jewish people."